Junior high school student Shōyō Hinata gains a sudden love of volleyball after seeing a national championship match on TV. Although short in height, he becomes determined to follow in the footsteps of a star player, nicknamed the "Little Giant", after seeing his plays. However, his dreams are destroyed in his first official match, where his team suffers a crushing defeat against the Junior championship favourite team, which includes the so-called "King of the Court" Tobio Kageyama. Hinata vows to follow in the footsteps of the "Little Giant" and enter Karasuno High School to defeat Kageyama, only for the two to wind up as unlikely team mates. By combining the genius-like qualities of Kageyama with Hinata's sheer athleticism, the duo create a brand-new volleyball tactic. Their new combo allows them to get over their differences and creates a strange alliance between the two filled with fun and laughter for them and their teammates. Thus begins the Karasuno boys' volleyball team's journey to the top. Written and illustrated by Haruichi Furudate, the series has been serialized in Weekly Shōnen Jump since February 20, 2012. As of March 2019, thirty-six volumes have been released in Japan. At their panel at New York Comic Con, North American publisher Viz Media announced their license of the manga and released the series in 2016. A radio drama for the series was broadcast in November 2012 on TV Tokyo's Sakiyomi Jum-Bang! program, with multiple voice actors providing voice samples for the characters. It was later distributed in December 2012 via Shueisha's Vomic website. An anime television series produced by Production I.G premiered on April 6, 2014 on MBS, other JNN stations, and with English subtitles on Crunchyroll. From episodes 1-13, the opening theme song is "Imagination" by Spyair, while the ending theme song is "Tenchi Gaeshi" by Nico Touches the Walls. For episodes 14 through 25, the opening is "Ah Yeah" by Sukima Switch, and the ending is "LEO" by Tacica. "Ah Yeah" is also used as the ending for episode 14, which has no opening. The anime has been licensed for digital and home video release by Sentai Filmworks. A second season premiered on October 4th of 2015. For episodes 1 through 13, the opening theme song is "I'm a Believer" by Spyair, while the ending theme song is "Climber" by Galileo Galilei. For episodes 14 through 25, the opening theme song is "FLY HIGH" by Burnout Syndromes, while the ending theme song is "Hatsunetsu (Fever)" (発熱 - はつねつ) by Tacica. A third season, titled Haikyū!! Karasuno High School vs Shiratorizawa Academy (ハイキュー!! 烏野高校 VS 白鳥沢学園高校, Haikyū!! Karasuno Kōkō VS Shiratorizawa Gakuen Kōkō), premiered on October 8, 2016. The opening theme song is "Hikariare" by Burnout Syndromes, while the ending theme song is "Mashi Mashi" by Nico Touches the Walls. Sentai Filmworks has also licensed the third season. A fourth season has been announced at Jump Festa '19 event. A "kickoff event" for the new series will be held on September 22, 2019. Supplementary compilation films have been released following the airing of the anime. After the first season and before the second season was aired in 2015, two compilation films were released. The first movie, Gekijō-ban Haikyu!! Owari to Hajimari (Haikyu!! the Movie: Ending and Beginning) was released on July 3, 2015 and the second movie, Gekijō-ban Haikyu!! Shōsha to Haisha (Haikyu!! the Movie: Winners and Losers) premiered on September 18, 2015. Two more compilation films were announced to be unveiled in fall 2017 after the third season aired in 2016. Both films were released in September: the first film, Haikyu!! Sainō to Sense (Haikyu!! Genius and Sense) on the 15th and the second film, Haikyu!! Concept no Tatakai (Haikyu!! Battle of Concepts) on the 29th. Shoyo appears as a support character in the Jump crossover fighting game J-Stars Victory VS for PlayStation 3, PlayStation 4 and PlayStation Vita. The series has been met with generally positive reception. As of January 2018, the manga had sold over 28 million copies. The first volume was ranked 22nd on the Tohan charts between June 4 and 10, 2012. The second volume was ranked 18th on the charts between August 6 and 12, 2012, and the third volume was also ranked 18th between October 8 and 14, 2012. Additionally, the series was ranked 4th out of a total of fifteen comics recommended in Honya Club's Zenkoku Shoten'in ga Eranda Osusume Comic 2013 ranking. In 2016, the manga won in the Shōnen category at the 61st Shogakukan Manga Awards. ^ "Haikyu!!". Sentai Filmworks. Retrieved August 13, 2018. ^ "The Official Website for Haikyu!!". Viz Media. Retrieved October 28, 2017. ^ ハイキュー!! 終わりと始まり(2015). allcinema (in Japanese). Retrieved April 10, 2018. ^ ハイキュー!! 勝者と敗者(2015). allcinema (in Japanese). Retrieved April 10, 2018. ^ ハイキュー!! 才能とセンス(2017). allcinema (in Japanese). Retrieved April 10, 2018. ^ ハイキュー!! コンセプトの戦い(2017). allcinema (in Japanese). Retrieved April 10, 2018. ^ "古舘春一が男子バレー描く「ハイキュー!!」ジャンプで開幕". Natalie (in Japanese). 20 February 2012. Retrieved 24 December 2018. ^ "Shueisha's online Book Navi listing" (in Japanese). Shueisha. Retrieved 18 May 2013. ^ "Viz Media Adds Kuroko's Basketball, Haikyu!, Yona of the Dawn Manga". Anime News Network. 9 October 2015. Retrieved 9 October 2015. ^ "List of episodes broadcast on TV Tokyo's Sakiyomi Jum-Bang! program" (in Japanese). TV Tokyo. ^ "Comic Natalie article on Haikyū!! radio drama" (in Japanese). Natalie. ^ "Official Haikyū!! page on Shueisha's Vomic website" (in Japanese). Shueisha. 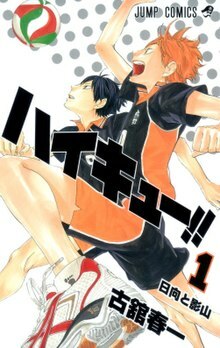 ^ "Shonen Jump's Haikyu!! Volleyball Manga Gets TV Anime". Anime News Network. Retrieved 22 September 2013. ^ "Haikyu! Theme Songs Performed by Spyair, Nico Touches the Walls". Anime News Network. Retrieved 16 February 2014. ^ "Sukima Switch, tacica Perform New Haikyu!! Theme Songs". Anime News Network. Retrieved 16 February 2014. ^ "Crunchyroll - Sentai Filmworks licenses "Haikyuu!!"". Crunchyroll. Retrieved 27 March 2014. ^ "Sentai Filmworks Licenses Haikyuu Volleyball Anime". Anime News Network. Retrieved 25 March 2014. ^ "Haikyu!! Volleyball TV Anime Gets Sequel". Anime News Network. 19 December 2014. Retrieved 6 January 2015. ^ "Haikyu!! Volleyball TV Anime Gets Season 3 in Fall". Anime News Network. 16 March 2016. Retrieved 16 March 2016. ^ Komatsu, Mikikazu (19 March 2016). ""Haikyu!!" TV Anime 3rd Season Set for Autumn 2016". Crunchyroll. Retrieved 20 March 2016. ^ Green, Scott (13 June 2016). ""Haikyu!" Season 3 Plans Updated". Crunchyroll. Retrieved 13 June 2016. ^ "Haikyu!! Season 3 Slated to Premiere on October 7". Anime News Network. 25 August 2016. Retrieved 25 August 2016. ^ Green, Scott (19 August 2016). ""Haikyu!!" Anime Season 3 Previewed - Fall Anime To Run 10 Episodes". Crunchyroll. Retrieved 19 August 2016. ^ "Burnout Syndromes, Nico Touches the Walls to Perform Themes for 3rd Season of Haikyu!! (Updated)". Anime News Network. July 31, 2016. Retrieved November 27, 2016. ^ "Sentai Filmworks Licenses Haikyu!! 3rd Season". Anime News Network. October 7, 2016. Retrieved October 7, 2016. ^ Hodgkins, Crystalyn (December 22, 2018). "Haikyu!! Manga Gets New TV Anime Series". Anime News Network. Retrieved December 22, 2018. ^ Chapman, Paul. "Volleyball TV Anime Haikyu!! Serves Up Season Four". Crunchyroll. Retrieved 2018-12-23. ^ "Haikyuu Season 4 release date: Anime confirmed for fourth season at Jump Festa 2019? Haikyuu manga compared to Shoyo Hinata's story in the anime [Spoilers]". Monsters and Critics. December 22, 2018. Retrieved December 27, 2018. ^ "Haikyu!! Gets 2 Compilation Films Before 2nd Season & Stage Play". Anime News Network. Retrieved 2017-09-21. ^ "Haikyu!! Volleyball Anime Gets 2 Compilation Films This Fall". Anime News Network. Retrieved 2017-09-21. ^ "2 Haikyu!! Compilation Films Open in September". Anime News Network. Retrieved 2017-09-21. ^ "Haikyu!! Manga Has 28 Million Copies in Print". Anime News Network. January 26, 2018. Retrieved January 26, 2018. ^ "Japanese Comic Ranking, June 4–10". Anime News Network. ^ "Japanese Comic Ranking, August 6–12". Anime News Network. ^ "Japanese Comic Ranking, October 8–14". Anime News Network. ^ "Japanese Bookstores Recommend 15 Top Manga of 2013". Anime News Network. ^ "Honya Club's Zenkoku Shoten'in ga Eranda Osusume Comic 2013 ranking" (in Japanese). Honya Club. This page was last edited on 21 April 2019, at 15:48 (UTC).